“It is better to live like a lion for one day than to live like a slave for 100 years.” The soft, high-pitched voice of Malala Yousafzai opens the documentary of her extraordinary life so far, “He Named Me Malala”. At age 15, Malala was shot by Talibani fighters who wanted to silence her message of empowerment for girls. There’s no way these men could have envisioned how much power she would wield in the aftermath. Her father, Zaiuddin–an educator and activist, encouraged her to speak her mind. When she was approached to ghostwrite a BBC blog about life under Taliban rule, she knew that she was putting herself in danger. Still, she struggled against the prohibitions and restrictions of the Talibs (as she referred to them), so the blogging provided her a necessary outlet for venting her frustration by exposing what was going on in her town, which is situated about 100 miles from Islamabad, Pakistan, in the Swat Valley. 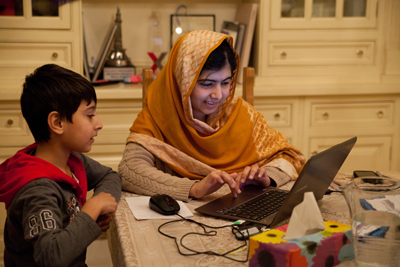 Malala admits that were her father a more traditional man, things would have been different. “If I had an ordinary father,” she explains, “I would have two children by now.” Bear in mind that Malala is only 18 years old. Her father’s influence is inescapable, as they are seen cuddling, chatting–even, amusingly, navigating Zaiuddin’s first tweet. From the beginning of her life, Zaiuddin was there to set her on a path to be out front. He named her for a martyred female fighter because he expected her to be an activist. When she was born, Zaiuddin sat down with the family tree and pondered the complete lack of any women’s names on the page. He then added the name of the girl who would become his eldest child: Malala. Her mother, Toor Pekai, had attended school when she was younger, but she dropped out early when she realized she was the only girl. Settling into their exile in Birmingham, England, Toor Pekai seems to have the greatest difficulty adjusting to the new life, although even Malala admits that it’s hard to fit in among the English girls. Her voice is tinged with sadness as she describes that she doesn’t fit in, but she can’t go home. Perhaps that’s the lot in life for someone so remarkable. Zaiuddin addresses the attempt on her life by saying, when asked who shot her, “It is not a person–it is an ideology.” Her very existence is a nose thumb to the idea that girls (and women) are somehow lesser. The Nobel Prize she won at 17 is further testament to that. At one point, when considering the importance of speaking out, Zaiuddin explains, “If I don’t speak, I would be the most sinful and guilty person in this world.” It’s clear his ethos is carried well forward in his daughter. It would be easy to reduce Malala to a living doll, a cardboard cutout that gets trotted out whenever there needs to be representation of a girl who survived adversity and challenges antiquated notions of women’s roles in society. When Boko Haram kidnapped hundreds of young girls in Nigeria, Malala was asked to come and intervene. “I’m still 17. I’m still a teenager. What can I do to help?” she wondered. Her very presence inspires confidence that things can be different. Even so, she’s still a teenager and a human being. Good portions of the movie are devoted to showing her clowning around with her brothers (who give as good as they get when it comes to snark and sarcasm). She searches online for pictures of Brad Pitt and Roger Federer. She’s a sweet young lady who has the poise of a woman easily twice her age. Interspersed throughout the movie, as the story moves through the details of the attempted assassination, her subsequent rehabilitation, and the seemingly non-stop world tour that followed, animations are woven throughout to illustrate more vividly the experiences that shaped her existence. In drawings reminiscent of Marjane Satrapi’s “Persepolis”, you see the story of the Malala for whom she was named, as well as the dejection of Toor Pekai at the point when she abandoned her own schooling. At times brutal in its honesty, “He Named Me Malala” is a breathtaking salute to a young woman who has defied every odd set against her. It creates context for those who haven’t heard the breadth and depth of her story, and it is–at times–unrelenting. You see Malala with her family, enjoying moments as any family might, but it is impossible to escape the knowledge that the self-imposed exile is all that saves her from the Taliban finishing the job they started a few years ago. 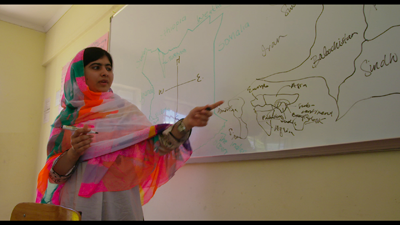 An author and Nobel laureate before 18 years old, Malala has a story worth hearing. One can only hope that this is just the first chapter in a long, long series. 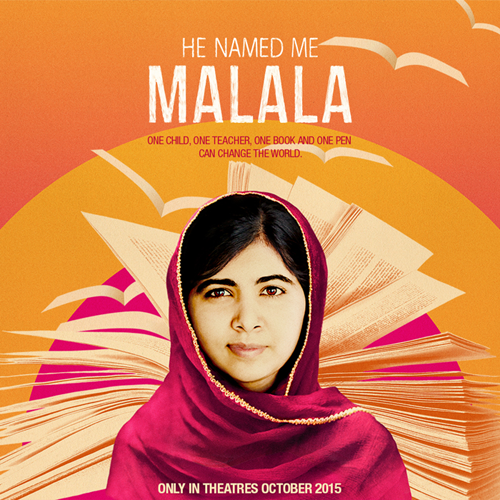 “He Named Me Malala” opens nationwide on October 9, 2015. This movie is rated PG-13 for thematic elements involving disturbing images and threats. This entry was posted in movie reviews and tagged he named me malala, malala yousafzai, movie reviews, zaiuddin yousafzai by crunchymetromom. Bookmark the permalink.